This page presents our English translation of the original French text of an article, published on 22 March 1884 in Le Monde Illustré (page 182), concerning a subscription to raise funds for a monument to Berlioz and the proposal of Édouard Alexandre, a friend of the composer, to honour him with a Hector Berlioz musical prize. The original text and the image that accompanies it are from our own copy of Le Monde Illustré. It is public knowledge that a subscription has been opened with the aim of erecting a monument to Hector Berlioz and that a committee, comprising the elite of French masters and friends of the illustrious composer, has undertaken to collect contributions from subscribers. With, we believe, extreme tact, the committee has resolved to wait till the subscription is closed or about to close before deciding on the nature of the monument and its location. But we can straightaway note the success of the appeal addressed to Berlioz’s admirers: a significant sum of money has been collected, and it is likely that the members of the committee will soon be called upon to make a decision concerning the making of the monument. But just as the monument committee was achieving valuable results, M. Édouard Alexandre, a member of the committee and one of the executors of Berlioz’s will, has come up with an elevated and fruitful suggestion. M. Édouard Alexandre thinks it most appropriate that a durable monument should remind people of the name of Berlioz, but he would also want the memory of the author of Les Troyens and the Damnation of Faust to be perpetuated through some useful artistic foundation; he has thought of creating a musical prize which would be awarded from time to time by the Académie des Beaux-Arts, subject to conditions decreed by it, and which would bear the title of Hector Berlioz Prize. Not only did M. Édouard Alexandre initiate this project, but he has also devised a complete plan which should enable him to raise with ease the capital needed for the creation of the Berlioz prize. He has secured the participation of not only the illustrious members of the present committee, but also of the publishers of Berlioz’s most important compositions: Brandus, already a member of the committee; Durand-Schœnewerk; Choudens; and the chief executive of the major publishing house Richaud, who has accepted to be the project’s treasurer. He is organising a number of large-scale concerts. M. Édouard Alexandre has commissioned from the eminent painter Yvon a painting, the subject of which would be a celebrated scene in the life of Berlioz: the occasion when Paganini played such a magnificent role, which Berlioz relates in his Memoirs with much emotion. 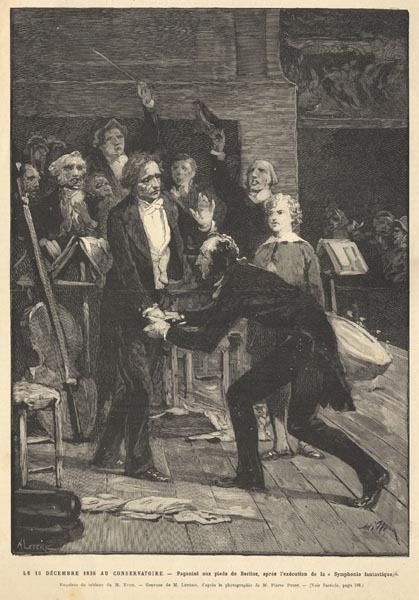 It was at the end of the year 1838; Berlioz, unwell, exhausted, and short of money, had given on 16 December in the Conservatoire a concert in which the Symphonie fantastique and Harold were performed. Paganini, who was in the hall, was hearing the latter work for the first time. It is this scene at the Conservatoire that M. Yvon is reproducing on canvass with all his artistry. Today we are publishing a reproduction of the sketch, until such time as the original is completed. We can announce straightaway that thanks to the unselfish generosity of M. Pierre Petit, the raffle prizes will comprise not only the painting of the great master, but also a hundred advance copies of photographs on rice paper of M. Yvon’s painting, made by the talented photographer; two hundred wide-margin photo-engravings of the same painting; an unspecified number of prints of this engraving, each worth five francs, a copy of which will be given to every person who attends one of the concerts organised for the benefit of the Berlioz Prize project. In addition M. Pierre Petit will, over a period of one year, pay into the fund for this project the profits from the sale of the reproductions of the painting. Finally, four magnificent prizes will be constituted from four paintings on canvas, which give a life-size reproduction of Berlioz’s portrait, as can now be admired at the business premises of M. Pierre Petit at no. 33, avenue de l’Opéra. In these circumstances, we believe it possible to predict for the concert and raffle a success comparable to that enjoyed by the subscription opened by the monument committee, and as of this moment we can be confident that the prize destined to perpetuate the memory of Berlioz for ever is now a reality. Viscount Delaborde, permanent secretary of the Académie des Beaux-Arts and president of the Berlioz Committee, hopes to persuade the Institut to accept the funds raised by the raffle for the creation of this prize. 16 December 1838 at the Conservatoire. — Paganini at Berlioz’s feet, after the performance of the « Symphonie fantastique ».